For some of us, Christmas is all about tradition and ritual: think taking the same decorations out of the special box where they spend the rest of the year and lovingly placing them on the Christmas tree year after year. For others, it's an opportunity to enjoy a fun bauble shopping spree for the latest crazy designs. From llamas to mermaids – and every creature and object imaginable in between – the kitsch Christmas trend is the perfect antidote to trad tree decor. So, throw caution to the wind and enjoy Christmas like you've never seen it before. 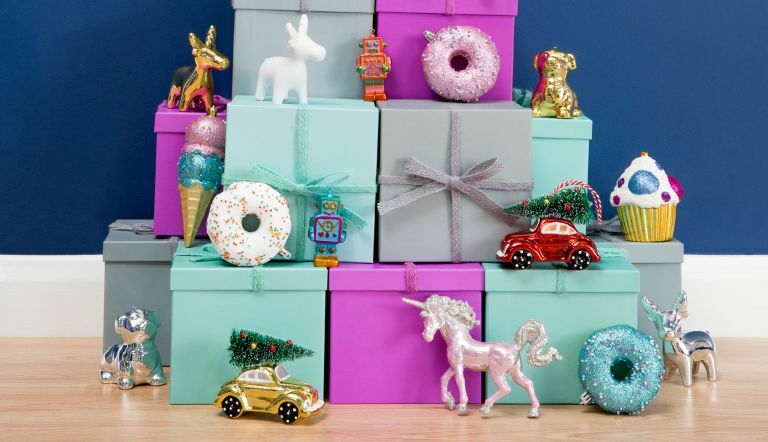 From unicorns to cupcakes and doughnuts, all in irresistible pastel shades, this year's Christmas decorations from Poundland are ticking all the boxes. Playful and cute, but with just enough uniformity to look good when they're all up on the tree, these bonkers baubles are guaranteed to please the whole family. For some of us, spending Christmas in a hot country is the ultimate gift. Riffing on the idea of Christmas spent in the tropics, Asda's George Home range have created a Santa's Vacation collection, complete with Santa in a yacht, pink flamingos, and equally pink flying pigs (because why not). Very colourful and rather zany – we love it. Tired of red, green and gold? John Lewis have a Sapphire Christmas decoration line this season. Crabs, lobsters, octopi and sea urchins grace this blue-toned range, which is on the more adult side of this year's kitsch offerings. Have yourself a sea-themed Christmas – or just pick one or two items to liven up an otherwise classic Christmas tree. Who doesn't love a brussels sprout with their Christmas dinner? Ok, trick question, lots of people don't. They're nice to look at, though – actually, they look rather better up on the Christmas tree than on a plate. Cue brussels sprout-shaped baubles from The Letteroom. Don't want green on green? Fruit offers endless opportunities for injecting your tree with colour. These delicious-looking glass fruit baubles are from The Contemporary Home. Given that Britain is a nation of dog lovers, is it really surprising that we now have dog-themed cushions, dog-shaped slippers and plant pots? And why should Christmas be any different? Retro Glass Pug Dog Bauble (below) from The Contemporary Home, £6. Pugs are inevitable, but our favourite is this dressed-up dachshund (below), £10.50 from The Contemporary Home. A perfect hot dog is a thing of beauty, right? Even better if you can just look at it without any temptation to eat it – easy with this gorgeous range of fast food-inspired decorations from Sass & Belle. Gilded pizza? Nothing surprises us any longer. Who needs Santa when you can have Bowie instead? The pop music-inspired collection from Selfridges features an intricate glass bauble tribute to the late musician (below). Along with music paraphernalia-themed decorations, there's this cassette-tape replica (below). Perfect for those who want something truly different. This one's for those who rewatch The Red Shoes every Christmas – a sequinned, unabashedly camp red shoe decoration from Jan Constantine. Or how about a croc in a tutu (below)? Because why wouldn't you, if you could? At £2 from Flying Tiger Stores, it's an offer you can't refuse. Mermaids are taking over: there is mermaid hair, mermaid make-up, mermaid outfits... in fact, if you have a pre-teen daughter, you've probably heard all about mermaids already. And because there's no point resisting, why not find space for a (very) little mermaid on your Christmas tree? This mermaid decoration from Sass & Belle, means business, complete with long hair. What is it with llamas at the moment? We're not sure, but they are cute. Perfect as a slightly mad accent in an otherwise sane decorating scheme. This one is from Homesense. Are unicorns getting a bit old? Not if they're iridescent glass unicorns from The Gifted Few! For children big and small. Sorry everyone born in the '80s and '90s, you're probably sick of being called a 'millennial', but here we are. Decorate your tree with this Avocado On Toast Christmas ornament from Urban Outfitters, because self-deprecation, and because it is a little bit cute.